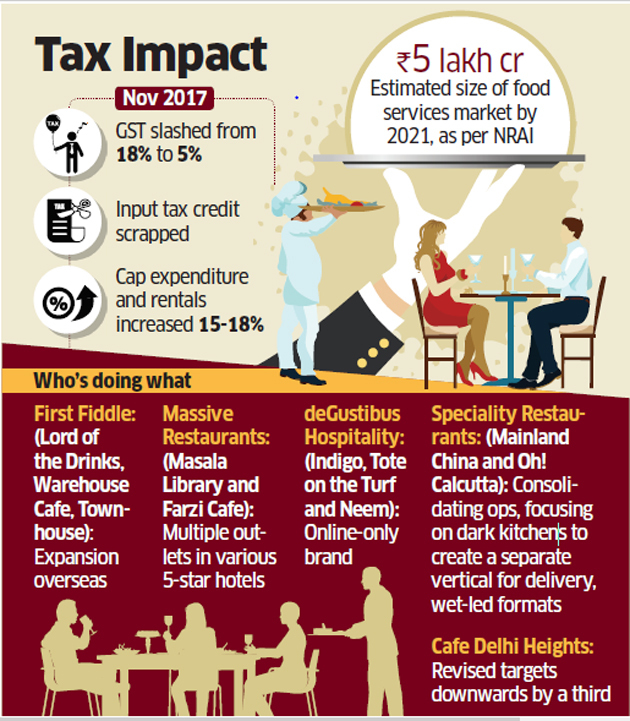 About a dozen prominent restaurant brands have either halted expansion in the country or revised targets downwards over a year after the government scrapped input tax credit (ITC) under the revised goods & services tax regime. A few others said they would set up only online outlets or within hotel premises where they can continue to avail of the tax credit. “We are dealing with a 25-30% loss in EBITDA after the restaurant sector was denied input tax credit. We will stop expanding in India and set up outlets only overseas if a rollback doesn’t happen this year,” said Priyank Sukhija, chief executive of First Fiddle Restaurants, which operates Lord of the Drinks, Warehouse Cafe and Townhouse. In November 2017, the government cut GST rates on restaurants to 5% from 18%. But it also scrapped ITC, which the industry said escalated capital expenses and rentals by 15-18% as they could no longer claim credits on the GST they paid on raw materials and rent, and use those to offset tax liability. Hiking prices by 3-5% and passing on some cost to customers have not been enough to protect margins, they said. “We have decided not to invest in new brick and mortar stores this year, unless things for the sector improve. Instead, we are planning to set up an online-only restaurant brand,” said Anurag Katriar, CEO of deGustibus Hospitality, which runs the brands Indigo, Tote on the Turf and Neem. “The denial of input tax credit has led to capital expenditure going up and margins coming under pressure. Besides, a lot of business is moving online,” Katriar said. Deep discounting by heavily funded online delivery platforms such as Swiggy and Zomato has changed the dynamics of the sector, impacting footfalls and diverting consumer traffic to these platforms. These platforms, though, gave the restaurant industry the option to set up online-only outlets where the costs are less. Others such as Massive Restaurants is setting up outlets within hotel premises. Restaurants within hotels which charge room rates of more than Rs 7,500 per night need to pay GST at 18%, but they can claim input tax credit. Besides rollback of ITC, inflationary pressures, hyper-local delivery stores, steep rentals and intermittent localised regulations have also hit growth, industry official added. Speciality Restaurants, which runs Mainland China and Oh! Calcutta, is looking at multiple ways to counter input tax credit issue, including stepping up online presence, said managing director Anjan Chatterjee. “The ITC rollback has significantly dented profitability of the organised sector and more particularly for operators who have premises on leases,” Chatterjee said. “We are consolidating and expanding our oriental cuisine formats at locations which fit into our financial matrix. Also focusing on dark kitchens to create a separate vertical as delivery of food is growing at a faster pace. The wet-led formats are also being expanded, looking at millennials,” he added. A report on Indian food services by the National Restaurant Association of India estimates the market to be Rs 5 lakh crore by 2021, and lists challenges such as real estate costs, taxation and high attrition.